This module is useful for keep informed about exchange rate of a single currency to another specified currency. If your site is oriented only to a particular country and you want to keep informed your visitor regarding the exchange rate of your local currency to the target country currency your can set this module to show only this information. The module obtain the exchange rate from the Google Finance site. 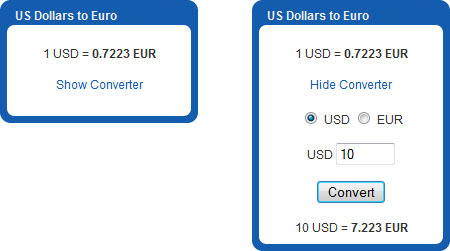 In add of the exchange rate the module become available also a very simple currency converter allowing to switch between the two currencies interested and calculate on real-time the conversion of a specific sum of money from one currency to the other. This converter can be show or hide using the provided link inside the module interface. The exchange rate is loaded from the external site using AJAX when the main page is fully loaded. This for avoid to slow down the loading of the main page waiting the result from the external site. Another feature is to "store" the just loaded exchange rate into the user session params. This solution has been added to avoid to reload again the exchange rate every time the users visit the page where the module is present. Using the configuration settings is possible to set the time (in minuts) after passed the module must reload an updated exchange rate.